Shoppers Drug Mart has a BOGO offer today! When you buy any 1 participating shampoo or conditioner you can get 1 Free! 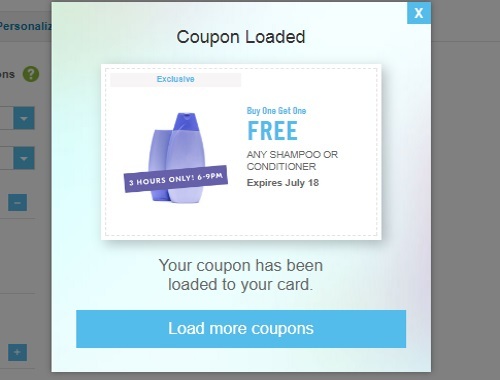 Load the coupon to your Optimum card (via your email/the Shoppes Drug Mart website) to get the offer in-store when you shop! Discount comes off at checkout. Offer is applicable to one product only. Excludes salon and specialty haircare. Offer is valid Tuesday, July 18 for three hours only 6-9pm. Click here to view the Shoppers Drug Mart personalized coupons.